Private Internet Access isn't quite the bargain it was, but you still get plenty for your money: a wide range of feature-packed apps, instant Netflix unblocking, some very useful expert-level tweaks, and a decent-sized network which is very fast in many areas. Private Internet Access (commonly known as PIA) is a capable VPN provider which delivers more features than many of the competition for a fraction of the price. The network is a reasonable size, with over 3,300 servers in 32 countries. Wide platform support includes apps for Windows, Mac, Android, iOS and Linux, browser extensions for Chrome, Firefox and Opera, and there are detailed setup tutorials for routers and many other device types. Extras range from the simple and straightforward (built-in blocking of ads, trackers and known malicious websites) to the more low-level and technical (a SOCKS5 proxy for extra speed, port forwarding support, the ability to select your preferred encryption, authentication and handshaking methods), and there's 24/7 support to help solve any problems. If all that sounds appealing, you even get more choice of payment methods than usual, with support for cards, PayPal, Bitcoin and gift cards. Significant updates since our last review include a new Windows client with a revamped interface, and a transparency report on the number of recent subpoenas and court orders asking for user information. Private Internet Access has raised its prices significantly since our last review, but that's not as bad as it sounds. The service might not be the bargain it once was, but it's still cheaper than many competitors. The monthly plan costs you just $9.99, for instance, which compares very well with providers such as CyberGhost ($12.99), ExpressVPN ($12.95) and NordVPN ($11.95). Paying for two years up-front cuts the cost even further to just $3.49. There are cheaper deals around - NordVPN is priced at $2.99 over three years - but it's still one of the lowest prices you'll see from a top commercial VPN. Payment methods are a highlight, with the company supporting cards, PayPal, Bitcoin, Amazon Pay, gift cards and many others. There is one small signup plus. Some VPNs say customers are only allowed one refund, ever. Private Internet Access says that if you purchase a new account more than three months after the last refund, you'll be eligible for another. This VPN's privacy features start with its use of the highly secure OpenVPN on desktop and mobile devices. While most VPN apps use AES-256 encryption, by default Private Internet Access apps default to AES-128 encryption, with SHA1 authentication and RSA-2048 handshaking. That's not going to make you significantly more vulnerable to attack at your local Wi-Fi hotspots, though, and this is only the default. Unlike almost anyone else, Private Internet Access allows you to adjust your encryption settings, so in a click or two you can ramp up the encryption to AES-256 and (if you prefer) choose alternative authentication and handshaking alternatives from the app settings. Private Internet Access apps have both DNS and IPv6 leak protection to help shield your internet activities. There's also a kill switch to disable your internet access if the VPN drops. Unlike some of the competition, this isn't only available on the desktop – the iOS and Android clients get it, too. Get connected with the Chrome extension and you'll find a bunch of bonus privacy features (block location access, third-party cookies, website referrers and more). You could set these up separately and for free, but the extensions make it easier and they do add worthwhile extra layers of protection. Perhaps best of all, Private Internet Access has opened up its browser extensions, iOS apps and Apple libraries up to scrutiny by making them open source (the desktop source should be released very soon.) This allows other developers to freely examine the source code, assess its quality, report bugs, maybe check to see whether it's doing anything which might compromise your privacy. It's a smart move, which we think indicates the company is doing its best to be transparent about how the service works. Does this mean the company is trying to hide something? No, there's more information available on its logging policy, it’s just buried deep in the Support section. The 'Do you log the traffic of your users?' article states that Private Internet Access "absolutely does not keep any logs, of any kind, period." It explains that logs which might otherwise be maintained are redirected to the null device rather than being written to the hard drive, which means they simply disappear. "We can unequivocally state that our company has not and still does not maintain metadata logs regarding when a subscriber accesses the VPN service, how long a subscriber's use was, and what IP address a subscriber originated from. Moreover, the encryption system does not allow us to view and thus log what IP addresses a subscriber is visiting or has visited." If you've checked out VPN provider policies before, you'll know that these kind of claims can't always be trusted. But you don't have to entirely take Private Internet Access at its word, because another page points users to public court documents demonstrating the point. These record a subpoena served on Private Internet Access but show that the only data provided was the general location of the server IPs. Absolutely no user-related data was given up. Since our last review, Private Internet Access has also began publishing a Transparency Report detailing any official requests for information, and user data handed over. The full six-month report for July through December 2018 records 18 subpoenas received and two court orders, with no data produced for any of these requests. While this is encouraging, we'd like to see Private Internet Access do more. The company could start by making it easier to find the current logging policy, but we'd also like to see it follow providers like NordVPN by allowing a third-party audit of its systems. That's the best way to reassure potential customers that any VPN is living up to its no-logging promises. Every VPN promises a high-speed, ultra-reliable network, but the reality can be very different. That's why we look past the enthusiastic marketing, and put every VPN we review through our own intensive tests. These began by connecting to all 52 Private Internet Access locations. We logged the connection time, ran ping tests to look for latency issues and used geolocation to verify that every server appeared to be in its advertised location. We next ran multiple speed tests – Netflix's Fast, OpenSpeedTest and TestMy, with further verification via SpeedTest – on three UK servers, 14 in the US, 19 in Europe and more distant servers across Asia, Australia, New Zealand and more. Just trying to connect to a VPN can tell you a lot about the service, and Private Internet Access performed very well. We ran the connection test twice on all servers, and didn't have a single issue. Connection times were faster than usual, and although these unsurprisingly increased with distance, this was never more than we expected, and not enough to become an issue at any time. Our geolocation tests also gave positive results, with all test server locations matching those claimed by Private Internet Access. Download speeds from our nearest UK servers were excellent at around 68Mbps, probably as much as you could expect for any VPN on a 75Mbps fiber broadband line. If you have a faster connection, you might see even better results. European speeds dropped off a little with the more distant servers, but were still consistently fast at 50 to 65Mbps. Switching to the US made no major differences, as most of our test servers still hit 50 to 65Mbps. There were more exceptions - Las Vegas struggled to reach 10Mbps during a couple of tests - but this could have been a temporary issue. Even if it wasn't, in a real life situation we could have just switched to another US server and it would have been business as usual. Long-distance connections to Asia and elsewhere hit a very usable 20-40Mbps for most locations (Australia, Hong Kong, India, Japan, Singapore, the UAE). That can't compete with the 60Mbps and more than Hotspot Shield delivered from most locations, but it's more than enough for most purposes. Connecting to a VPN can get you access to all kinds of geoblocked websites, hopefully avoiding those annoying 'not available in your region' error messages. To test the unblocking abilities of Private Internet Access, we connected to multiple US and UK locations, then attempted to access US-only Netflix and YouTube, as well as BBC iPlayer. Bypassing YouTube's protection is relatively easy, and as long as you have an IP address which seems to be in the right country, you should be fine. Sure enough, Private Internet Access allowed us to view US-only content on each of its US servers. BBC iPlayer is more of a challenge. Private Internet Access didn't get us into the service during our last review, and unfortunately it didn't work this time, either. Accessing Netflix is the gold standard of VPN unblocking, and we've seen a lot of people saying Private Internet Access can't do it at the moment. That wasn't our experience, fortunately, and all five our of test US servers gave us instant Netflix access. Private Internet Access fully supports P2P, and we don't just mean on a couple of specialist servers hidden away somewhere. You can use torrents from any location, with no bandwidth or other limits to restrict your activities. There's an unusual bonus in Private Internet Access' support for port forwarding. This enables redirecting incoming connections to bypass a NAT firewall, and in some cases, may help improve P2P download speeds. Even the port forwarding document only mentioned in passing that the technology could "potentially optimize torrent performance", without offering any further clues. Still, the company scores well on the fundamentals – large network, no logs, Bitcoin support – and on balance it makes a fair torrenting choice. Sign up for Private Internet Access, and the company does its best to streamline the setup procedure. We were immediately redirected to the Download page, where there were direct downloads for Windows, macOS, Linux, and links to the Android and iOS apps and assorted browser extensions (Chrome, Firefox, Opera). These aren't just file links. We clicked the Windows client, and as well as pointing us to the installer, the website redirected to a page displaying a setup guide. There are some unusually thoughtful touches. Instead of having a single Windows download link, for instance, you can choose from 32 and 64-bit builds. If, for some reason, a recent update is causing problems, you can download a previous version, and (new since our last review) the site now lists the changes for every new build. Advanced features included a download for the Android APK file, allowing you to manually install it on devices where necessary. Private Internet Access does a particularly good job with OpenVPN configuration files, which are necessary if you're setting up many third-party apps. These are sensibly named with the country and region or city, such as 'US Chicago.ovpn' (contrast that with NordVPN's 'hr16.nordvpn.com.udp1194.ovpn'). You don't have to live with the default OpenVPN settings, either. There are separate downloads available for different encryption settings, to switch to TCP connections and more. There's also an OpenVPN Configuration Generator on the website where you can build different setups for individual groups of servers, potentially saving you a lot of hassle. We've seen marginally better setup support – ExpressVPN's activation code system allows setting up clients without manually entering usernames and passwords, plus its tutorials are more numerous and detailed – but Private Internet Access offers more help than most, and the chances are you'll have your devices set up and working with minimal hassle. We weren't big fans of Private Internet Access' Windows client in our last review, mostly for its odd system tray icon-based interface, so we were happy to see it had been replaced with an entirely new client. But would this really be any better? The initial signs were positive. Installation was easy, and clicking the Private Internet Access system icon now opens a very simple and straightforward client window: a big connect button gets you connected to your nearest server, and status areas tell you when you're connected, and display your original and new IP addresses. While this is an improvement on the last client, it also has one new annoyance: the client isn't presented in a regular application window. When you click the system tray icon, what appears looks like a regular window, but it can't be dragged around the desktop to your preferred position, and it also disappears if you click on the desktop or another application. You must then click the system tray icon again to bring it back, which can quickly become annoying. A Performance chart displays a graph of recent internet traffic. The average user maybe won't be interested in many of these, but it's still great to see such an exceptionally configurable interface. We much prefer this to the more common approach, where you're forced to live with whatever design decisions the VPN provider has made. The client's location picker is another highlight. Instead of a simple country list, the client displays city locations where available, complete with ping times, and includes a search box and Favorites system to help you quickly access whatever servers you need. The Settings dialog gives you a high level of control over how the VPN works. The Windows client only supports OpenVPN, for instance (there is no IKEv2, L2TP, PPTP or anything else), but you can choose UDP or TCP connection types, as well as selecting a custom remote port (53, 1194, 8080, 9021) and defining your own local port. Some locations support port forwarding, which makes it easier to set up and accept incoming connections to your system. The default encryption is only AES-128, but the Settings dialog enables changing that to AES-256 (GCM and CBC), and you can also alter the authentication method (SHA1, SHA256) and handshaking (RSA-2048 by default, RSA-4096 and other RSA and ECC options are available). You can also turn encryption off entirely, which isn't great for security, but will boost your speeds in situations where encryption doesn't matter much (watching streaming media, say). Elsewhere, a kill switch disables internet access if the VPN disconnects, reducing the chance that your real IP will be leaked. You get the option to use Private Internet Access' DNS servers, your own, or any other custom servers you prefer. And the MACE system to block domains used for ads, trackers and malware can be enabled or disabled with a click. Overall, while the client's new interface is an improvement on the last version, it's still a little awkward, and not as easy to use as most of the competition. The extra configurability rescues the package, though, and on balance it's a decent app, especially if you'll use the more advanced features. The Android app has a clean and stripped-back interface. Most of the screen is white space, with a large On/Off button in the center of the screen, and your chosen region and current IP address at the bottom. Tapping the current region displays a list of other locations. Each one has a latency figure, giving you an idea of its distance, but there are no other ways to sort or filter the list, and the app doesn't have a Favorites system. It's all very easy to use, at least. Tap a location, tap On, and you're connected within seconds. Choose another location and the app automatically disconnects from the original server, and reconnects to the new one. When you're done, tapping Off closes the connection and you're back to normal. Despite the simple interface, the app is surprisingly configurable, with more options and settings than many desktop VPN clients. You can choose UDP or TCP connections, for instance, with the ability to set local and remote ports, and request port forwarding. The app can be set up to automatically protect you whenever you access unknown or untrusted wireless networks. As with the Windows client, you're now able to replace the default Private Internet Access DNS servers with your preferred alternative. There's support for using the app with a proxy, reducing packet size to improve reliability, and automatically connecting when the device or app starts. You can even have your handset vibrate to indicate when you're connected, far more convenient than the usual notifications. As with the Windows client, you're able to choose from four encryption options, ranging from AES-128-GCM to AES-256-CBC, and six handshaking methods (RSA-4096 to ECC-521r1). It's good to see the app also has a built-in kill switch, enabled by default, to block internet access if the VPN connection drops. The app would benefit from a Favorites system, or at least a Recent Connections list, but otherwise it's a simple and straightforward VPN client with some unusual expert-level options. VPN mobile apps can look and behave very differently, but that's not the Private Internet Access way. Its iOS app is almost identical to the Android version, at least in terms of the main operations. There's the same basic streamlined interface, list of locations, and Connect button. If you've ever used another VPN app, ever, you'll immediately know what to do (even total newbies won't be too far behind). Unfortunately, there's the same lack of a Favorites system, an annoyance if you'll regularly be switching locations. In an interesting move, the iOS app replaces Private Internet Access' ad and malware-blocking MACE system with a custom Safari malware blocker. It's good (and very unusual) to see a VPN provider who has the insight and resources to tailor its apps to best fit each platform. There are a decent set of options and settings, especially for an iOS app. You can still switch protocol from OpenVPN to IKEv2 or IPsec, choose UDP or TCP connections, set a custom port, use your favorite DNS, take fine-tuned control over encryption and enable a kill switch to protect you online. But as usual, there aren't quite as many low-level tweaks and settings as you get with Android. You can't adjust packet size, for instance, or control when and how the app connects, or block local network access while the VPN is up. It's far from perfect, then, but overall Private Internet Access' iOS app is a capable and straightforward VPN client. Add a Favorites list and we'll be (mostly) happy. Using the Private Internet Access apps isn't difficult, but having to keep switching between your regular application and the VPN client can still be a hassle. 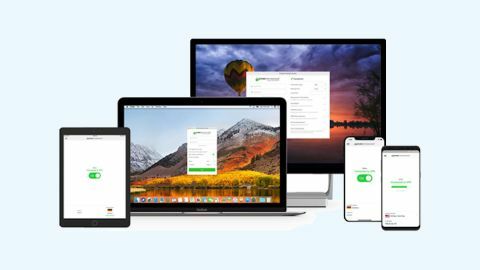 Like ExpressVPN and NordVPN, Private Internet Access now offers add-ons for Chrome, Firefox and Opera, enabling you to connect to the VPN directly from the browser interface. This only protects your browser traffic, but if that's not an issue, the extension makes Private Internet Access much easier to use. The add-ons have been updated since our last review, and now look and feel much like the Windows client. A simple opening interface displays the current location, and there's a full list of locations (and a Favorites system) if necessary. Latencies can optionally be displayed alongside each server, and you can enable the VPN from inside your browser with a couple of clicks. The add-on can block location access, for instance, and prevent websites accessing your camera or microphone. It's able to stop WebRTC leaks, and variously block or disable Flash, third-party cookies, website referrers, hyperlink auditing, address and credit card auotfilling, and more. It's a surprisingly capable setup, although you'll need to treat it with care, as disabling everything could break some websites. If you do have problems, a Bypass List enables specifying websites which you don't want to use the VPN. If they don't work as they should with the VPN on, add them to the Bypass List and their traffic will be rerouted through your regular connection. All this functionality means there are lots of settings to explore, but on balance the add-ons work very well. If you're looking for simplicity, you can just choose a location and click Connect, much like any other VPN extension. But more experienced users can head off to the Settings, where they'll find more features and functionality than just about any other VPN browser add-on we've seen. The Private Internet Access Support Center has a web knowledgebase with articles covering troubleshooting, account problems, technical complications and more. These don't always have the detail you'll see with ExpressVPN, but they're not just bland descriptions of app features, either. For example, a Security Best Practices encryption article gives users some background on encryption, authentication and handshaking methods, and more. A Guides section has setup articles and tutorials for all supported platforms. Some of these are relatively basic, but there's still a lot to explore, with, for instance, 15 articles on Android alone. Welcome extras start with a News page which alerts users to new servers, app updates, service issues and more. That's worth checking, even if you're only a prospective customer, as it shows you how Private Internet Access is working to improve and enhance its service. If you can't solve your issue online, the website suggested that you should now be able to ask questions via live chat, at least some of the time (9:00-18:00 Monday to Friday MST only). Unfortunately, this didn't seem to be available during the review. There was no Chat button, and the Contact Us page asked us to set up a ticket via email. After much searching, we found a comment by a PIA employee saying 'live chat is temporarily disabled at the moment due to higher than average ticket queues.' That's disappointing, and it doesn't help that the comment was tucked away on PIA's subreddit. If a service is going to disable such an important feature, we would expect it to keep customers informed, not just turn it off and hope no-one notices. There is some good support news, though: moving those live chat operators over to the tickets must have improved support times, because we had a friendly and helpful response to our test query in under two hours. That still can't compete with the speedy chat responses we've had from providers like ExpressVPN, but it's better than many, and suggests you may not have to wait very long to begin a support conversation. The Windows client interface still needs some work, but Private Internet Access scores in many important areas: it runs on almost anything, is crammed with features, offers decent performance and excellent value, with Bitcoin support thrown in.